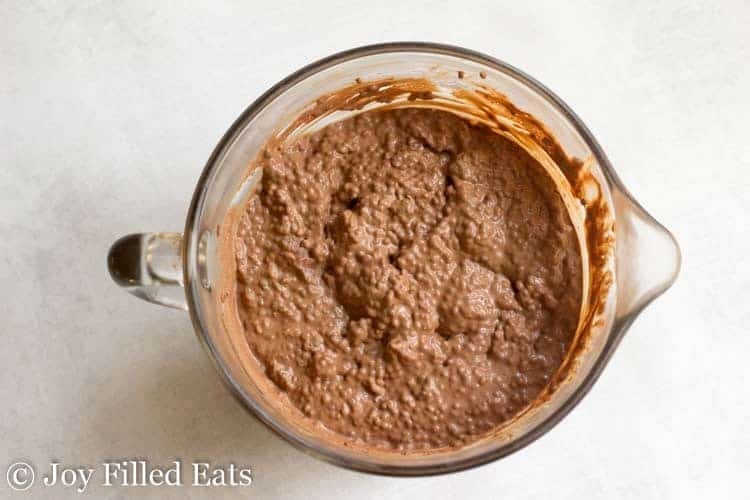 When you are craving chocolate and need something without a lot of fuss turn to this easy Chocolate Chia Pudding Recipe. Stir a few ingredients together and feast on a pudding healthy enough for breakfast and sweet enough for dessert. Chia seeds are magical. Did you know that? Stir them into some sweetened liquid and a few hours later you have pudding. It’s just as easy as the instant pudding mixes of your childhood. I chose to make my dark chocolate chia pudding dairy free but you don’t have to. Swap out some coconut milk for cream if you’d like. I make my chia pudding with coconut milk and almond milk to keep it dairy free. If I’m not careful I consume way too much dairy and stall my weight loss. 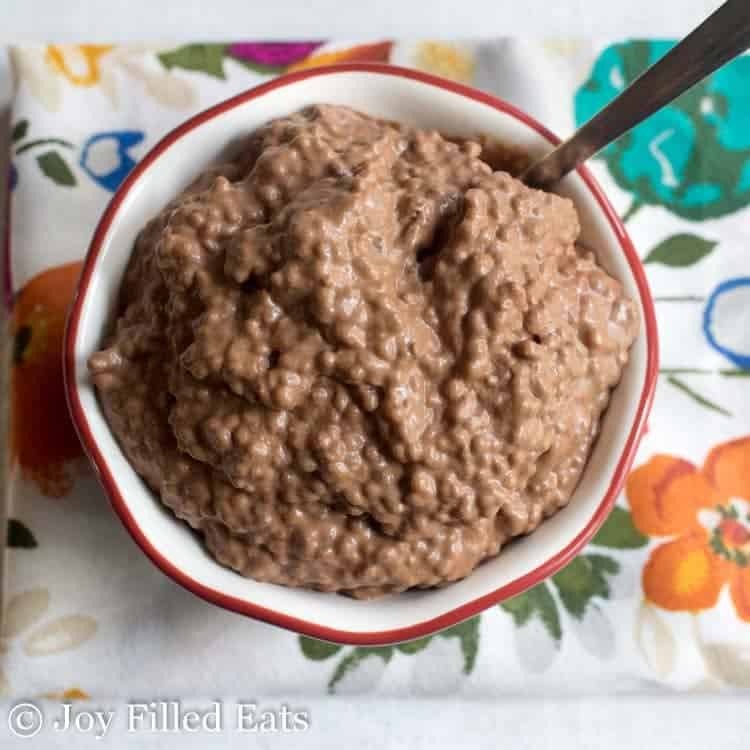 This Chocolate Chia Pudding Recipe is so filling. 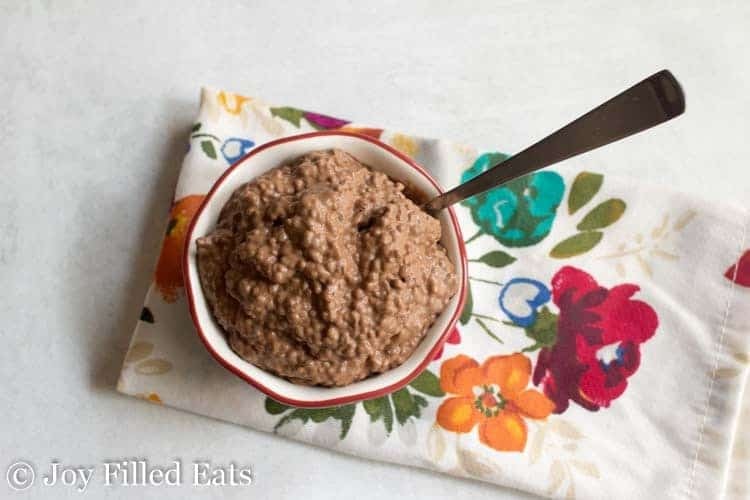 It is a perfect quick breakfast for busy mornings. You can prep on Sunday for a week’s worth of breakfast in just 5 minutes. This is debatable. They have a lot of fiber and can help you feel fuller longer. So as part of a healthy way of eating there are benefits to chia seeds. But, they aren’t a magic diet pill. Adding chia pudding to an unhealthy diet won’t do much good. To be honest I don’t chew my chia seeds. I don’t mind them in my Chocolate Chia Pudding but don’t love the taste when I chew them. They have so many health benefits that I use them anyway and just eat my pudding without chewing. The same way I don’t bite raspberries or blackberries because I don’t like the seeds stuck in my teeth. It is not mandatory to chew pudding. Full disclaimer I never liked tapioca pudding either. Rice pudding I love. But tapioca is a bit strange of a texture to be. I’m sure you can tweak this Chocolate Chia Pudding Recipe to make it into other flavors. I like using stronger flavors in dairy-free recipes so they don’t all taste like coconut all the time. Chocolate, coffee, peanut butter can all help hide that coconut flavor. Or you can play it up and add some toasted coconut flakes and coconut extract. Maybe a few drops of pineapple extract too and make a pina colada pudding. 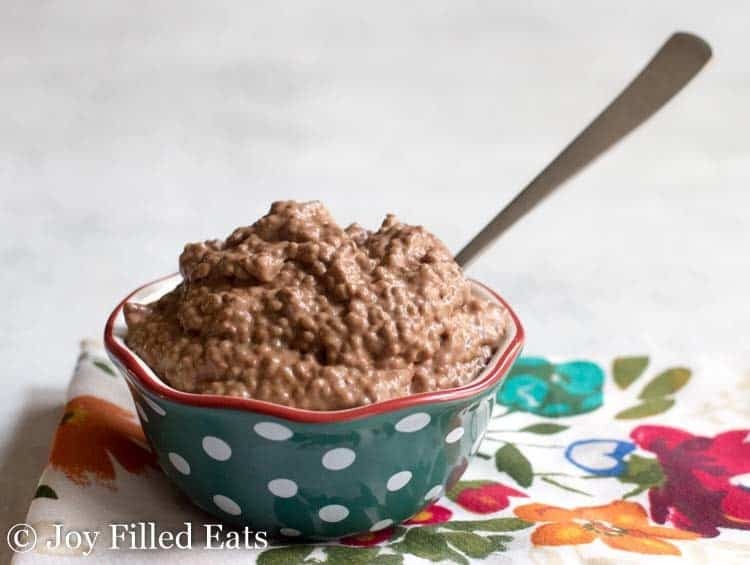 I hope you enjoy my dairy-free chocolate chia pudding recipe! 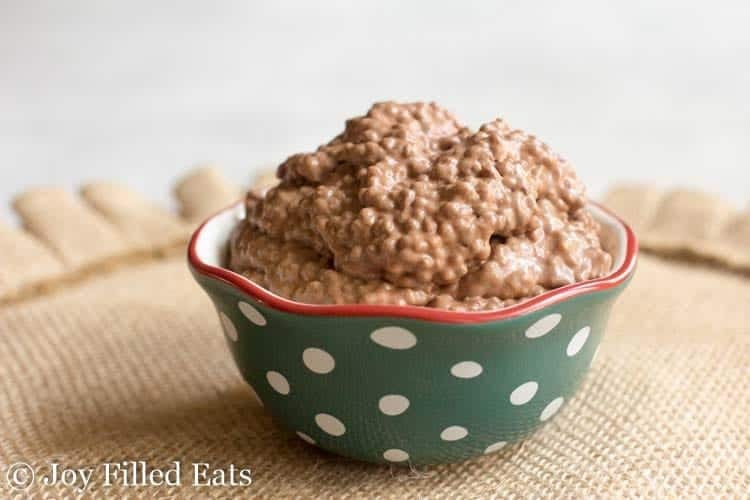 When you are craving chocolate and need something easy turn to this easy Chocolate Chia Pudding Recipe. Stir a few ingredients together and feast on a pudding healthy enough for breakfast and sweet enough for dessert. In a large bowl whisk the coconut milk until smooth. Add the other ingredients and stir thoroughly. Chill until thickened. Yes. If you are using a blend that is 1:1 for sugar like lakanto you will need 1.5 to 2 times the amount listed. You can just add it to taste. 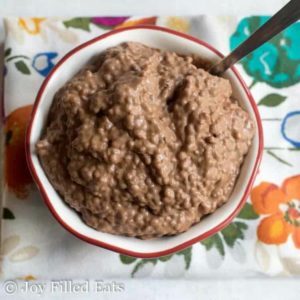 Is chia pudding a THM stand alone breakfast or would I need to have more protein with it? I think it is fine as a breakfast. If you'd like a little more protein you could have a hot beverage with collagen in it. 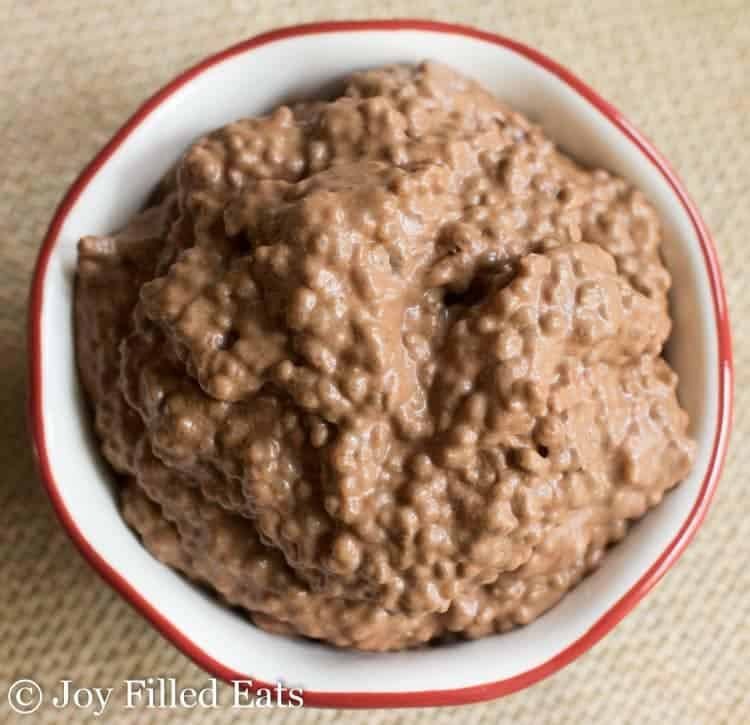 I was specifically looking for a recipe for chocolate chia pudding using canned coconut milk and came across this one. I had to tweak the recipe a bit because it was too thick as written, maybe because I used a thicker variety of canned coconut milk (Chaokoh), I’m not sure. I ended up needing an extra cup and a half of almond milk (so 2 1/2 cups total), and then added an extra 1/4 cup (4 tbsp) cocoa powder to keep it plenty chocolatey. I sweetened with 8 sucralose drops instead of the recommended sweetener. Served with a substantial dollop of whipped cream, this was awesome! I’m going to try it with some unsweetened coconut next and try to get something like an almond joy or mounds. Thanks so much for sharing! I will definitely be making this again! I love chocolate chia pudding. It's my favorite! Thanks for a tasty way to get chia seeds into our diet. This makes quite a bit...can it be frozen? I haven't tried to freeze it. It does stay good in the fridge for up to a week. Taryn, your recipes are like finding a pot of gold, thank you! May I draw upon you "mad skills" to ask, how would you convert this recipe to make it peanut butter chocolate? I'm not so sure about the mad skills (lol) but I'd just whisk some peanut butter into the coconut milk in the first step. I think 1/4 to 1/2 cup depending on how peanut buttery you want it. You may want to add an additional tablespoon or two of sweetener as well. Enjoy! 1/8th of the recipe which is approximately 1/2 a cup. Taryn .. thank you sooo much for all your recipes. They never fail to impress me with the flavors and ease of preparation. I have found a number of Chia Pudding recipes on line and have tried them all. Yours is no exception.....however, I, too, am not a fan of the chunky, tapioca-like texture, so I grind my chia seeds in a high speed blender before incorporatiing them into the recipe. Works like a charm.....smooth pudding with all the fiber! Worked extremely well with your recipe too! Thank you!